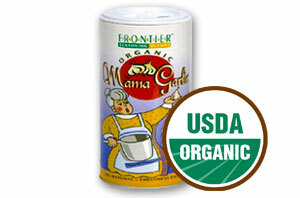 You love to cook and you care enough to use only high-quality, certified organic ingredients. You also want a handy, healthy way to get some big flavor for a little price. Well, have no fear-Mama Garlic is here! And she is going to bring the zing back to your meals and take your taste buds on a flavor adventure! So dial-up the dinner-time excitement with this fantastic seasoning blend! Mama Garlic is an easy way for garlic lovers to add garlic-plus a few tasty accompaniments-to bread, salads, soups, and entrees. It's handy both at the stovetop and the dinner table. This very tasty, very fresh blend of culinary basics (plus lemon!) is as versatile as seasonings get. When it comes to fantastic flavor, this mama knows best!